Slime mold is fascinating, because though it’s only a single cell organism with no brain, it somehow stretches its tentacle-like fingers in a coherent pattern in search for food. This time lapse footage speeds up the process of that goopy crawl (in reality it only moves a few centimeters a day), but you get to see how the simple yellow slime eventually envelopes everything around it. 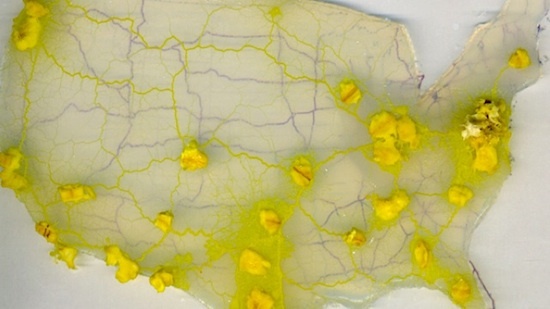 A slime mold is used to design an efficient United States and Canadian transport network.